Leaving the scene of an accident is a very serious offense, especially when another person sustains injuries. Drivers who strike a parked motorcycle or a person on a motorcycle and then leave the scene without exchanging identifying information or rendering aid are subject to ticketing, fines, and possible jail time. It seems unimaginable that someone would strike another human being with their vehicle and simply drive away, without stopping to see if the individual needs help. However, it is extraordinarily common in the state of Louisiana. Negligent drivers usually flee the scene in a state of panic because they don’t have a license or insurance, they were driving intoxicated, or they simply don’t want to face the possible repercussions of their actions. Contact Bart Bernard for a free case review if you have been injured in a hit and run motorcycle accident in Louisiana. Even if you have no idea who hit you, Bart Bernard can tap his extensive network of legal resources to help investigate your claim and bring those responsible for your property damage, physical injuries, emotional hardship, and other losses to justice. All consultations are offered on a contingency basis, so there is no fee unless you win your case. Louisiana has 113,778 registered motorcycles. Louisiana is among the top 15 states for motorcyclist deaths, with 89 in 2015. Louisiana is the state with the fourth highest number of hit-and-runs, after North Dakota, Montana, & Kentucky. There are 726 fatal crashes in Louisiana each year, making it the fourth-most-dangerous state for driving. Out of 50 Louisiana drivers, 33 are blatantly failing to obey signals or signs; 10 are driving under the influence of drugs or alcohol; and 4 are driving carelessly or inattentively. Nationwide, approximately 11 percent of all crashes involve a driver who has fled the scene. In October 2016, a 31-year-old Baton Rouge motorcyclist was killed in a hit-and-run crash on Florida Boulevard near Sharp Road. The victim was struck and ejected from his motorcycle around 4:11 p.m. by someone driving a white, lifted, Chevrolet 1500 pickup truck. The driver fled the scene and the motorcyclist later succumbed to his injuries in the hospital. Stories like this are all too common. A Baton Rouge hit and run motorcycle accident lawyer will look at the accident reports and witness statements, consult with accident reconstruction experts, check with local collision shops to find out if the perpetrator took a vehicle in for repair, locate surveillance footage, find additional witnesses, and do whatever we can to learn more about the events leading up to the crash. What can a hit and run motorcycle accident lawyer do for me? Even if you don’t know the identity of the person who hit you, an experienced Louisiana hit and run attorney can be a great asset in helping you navigate the complex maze of insurance coverages. In the absence of a known negligent party, uninsured motorist coverage may compensate for some of your injuries, but it is common to find insurers that balk at paying or extend a lowball offer that only covers a small fraction of the total losses sustained. It helps to have a lawyer on your side in cases like this who will fight for the compensation you deserve. What losses are covered in a hit and run motorcycle accident? The aftermath of a hit-and-run accident is an emotional time, especially since motorcyclists have such little protection when going up against a larger car or truck. Bart Bernard understands the confusion, heartache, and difficulty you’re going through and wants to help. 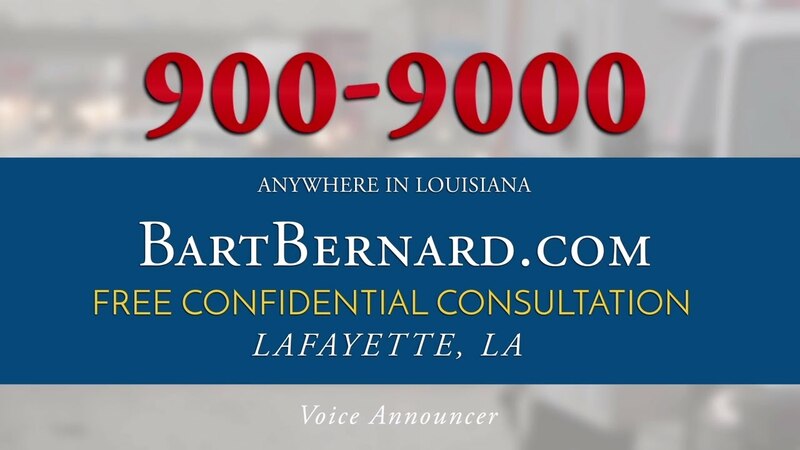 With offices in Lafayette and Baton Rouge, Bart Bernard is a leading Louisiana motorcycle accident attorney with a track record of success. He has been running his own firm since 1997, with prestigious professional distinctions as a member of Elite Lawyers of America and the Multi-Million Dollar Advocates Forum. The statute of limitations for filing a personal injury lawsuit in Louisiana could be as little as one year, but you may be granted an extension if the perpetrator’s identity has only recently become known to you. Do not hesitate to contact Bart Bernard to explore your full range of legal options. No legal fees are collected unless Bart Bernard wins money on your behalf!